This monumental Colum is located in the middle of Tiergardens, on Strasse de 17. It was Emperor Wihelm 1st who commissioned the statue to be built for the victory in the Franco-German war, which ended the unification against neighbours Denmark, Austria and France. Originally the column was located in front of the Reichstag building and was moved by the Nazi government in 1939, when new plans to develop the city were processed the column was moved to its current location. 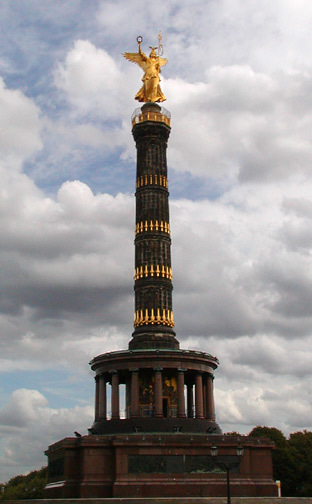 It is now a symbol of Prussian military victory. Albert Speer a visionary in Berlin who played a key role in reinventing Berlin claimed the new location would enhance the east/west axis running directly through the Tier gardens, furthermore showing the dive in Berlin through the Germania years. The Colum is crowded with a statue of the goddess Victoria also know as Nike the Greek goddess of Victory built by Phillip Drake, the statue is also mean to represent Borussia the allegory of Prussia. The statue is referred to by locals as ‘golden lizze’. The goodness is holding a sceptre with an iron cross and wreath typical associated as the equivalent of a trophy for the winners of the Olympics. 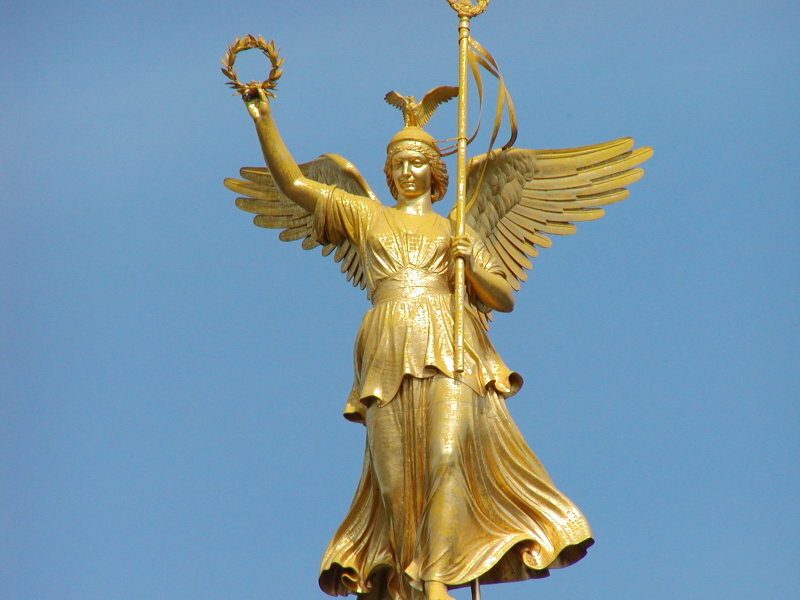 A statue of Victoria is also the motive on top of the Brandenburg gate suggesting Berlin wants to be represented as country of victory throughout it colour and conflicting past. The Colum itself was designed by Johann Heinrich Stack in 1864 who added mosaic patterns to the column depicting images of the German empire and battle scenes it also displays the events of 1870-71 and restoration of the German empire, gun barrels and cravings of eagles on the upper platform leading up the statue of Goddess Victoria however it referred to as the ‘Quadriga’. 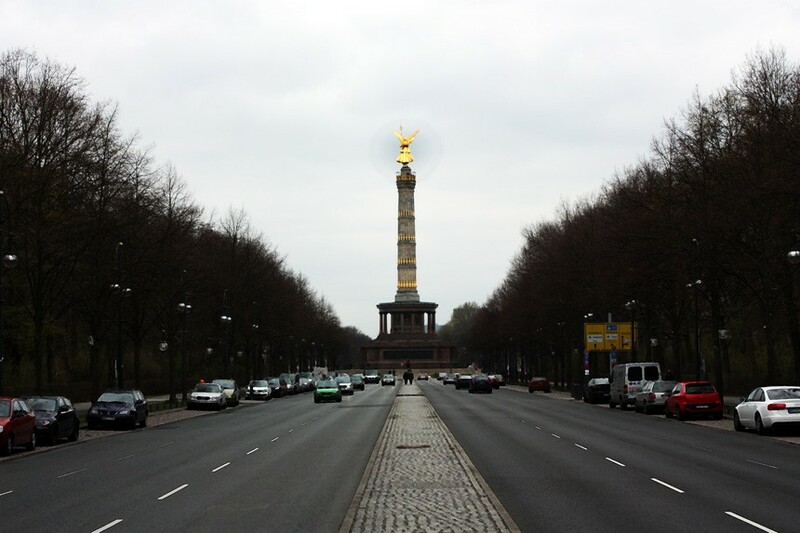 Today the Colum at the heart of a roundabout getting into the city centre and is remembered for US candidate now President Obama gave a speech to Berliners in 2008,also parades have taken place which end up at the Siegessaule. There is an observatory too where visitors and tourist can see views of the Brandenburg gate, Reichstag and the TV tower. The statue also features in U2’s music video ‘stay faraway so close ‘and it supposedly inspired Paul Van Dyk hit ‘from an angel’.